This post and giveaway were made possible by iConnect and Buddig. I was compensated for my participation in this campaign, but all opinions are 100% mine. Not only does this lunch include their favorite things tortilla, Buddig Premium Deli meat, blueberries, Craisins, and peanuts but it’s also fabulous because the kids can make their own lunch themselves! My kids still need a little supervision, especially with the cutting part, but it’s exciting to watch them make their own creations. I’ve watched this time and time again, when my daughter helps prepare a meal she seems to takes ownership of it and will eat it better than if I prepared it myself. This creation is a smiley face. The sandwich sushi rolls are the eyes and nose. The blueberries and Craisins make up the smile. The peanuts make the hair. Totally doable and fun, right? Spinach leaves or lettuce could easily be added as ears. Ranch dressing could be earrings. The sky is the limit! Buddig not only makes great tasting and affordable lunch meat but they’re offering a fun contest this summer. The summer of smiles! ? There are so many reasons this time of year that make us smile – warm weather, sunny days, picnic lunches, family vacations & more. Consumers are asked to post a picture of their family enjoying summer and flashing their biggest smiles on Facebook using the #BuddigSmiles. Every week from June 16 – August 18 Buddig will randomly select 12 entries to receive a $25 American Express gift card – that’s 108 total winners and a whole lot of smiles! ? This is a partnered post but all opinions are my own. Do you ever have a crummy day where you just can’t seem to shake it? It’s like you have your own version of Alexander and the Terrible, Horrible, No Good, Very Bad Day playing out before your eyes. I’ve had days like that. My most recent “bad day,” was this week and like most days, wasn’t absolutely terrible or completely bad. It just had some bad parts that I was choosing to dwell on and that messed up the rest of my day. Sometimes I need to step back and remember that while bad things may happen to me that are beyond my control, I can control my reaction. While I can’t avoid bad things happening I can direct my attitude and actions and make my day better. Here are a few things I do when I want to make a bad day good. Phone a Friend – Really, pick up the phone and call someone. Okay, so maybe they won’t answer but call the ones who will. I only have a few people who will answer when I call and my mom and grandma are two of them. Talking with someone you care about can do wonders. You can talk through your problems and then get your mind off of your troubles. Think of Your Favorite Things – I haven’t actually done this one but it’s one that my daughter suggests often thanks to The Sound of Music. 🙂 A few of my favorite things are puppies with wet noses, balloons, surprises, giving gifts, and hugs from my kids. Pump Up the Jam – Turn on some tunes and dance your heart out. Dance like no ones watching! My kids love to get in on this with me. Dancing to some old 60’s music with them cheers me up every time. Take It Outside – Get some fresh air, feel the sun on your back, listen to the birds sing, and stretch your legs. Being in nature always makes me appreciate the little things in life more. Mix It Up – Change your routine. When I get down I like to try and change up my schedule. Maybe a trip to the mall is in order or just slow down and drop a few things that were on the docket for the day. This week when it felt like everything was going wrong I changed up our daily routine and had an impromptu snack. We had popcorn, Jolly Time popcorn which seemed to fit what I was aiming for. Popcorn is usually an evening only, whole family snack but this day it was just for the kids and me. My son loves that popcorn is a snack that he and his sister can enjoy together. His allergies limit what he can have and it’s nice to see him able to eat the same thing as her. My daughter said that this piece looks like a flower blooming. I love her bright outlook on life and how she sees beauty everywhere! You can follow JOLLY TIME on Facebook for a chance to win an awesome prize pack. The contest runs through 5/20 so don’t wait to enter! What about you? What do you do to turn your frown upside down? If you are looking for a bright, cheery and delicious smoothie recipe don’t look any further, this Banana Blood Orange Smoothie is all you need in your life, trust me on this one. This is a recipe I have been making literally non-stop for the last couple of weeks and I can’t get over it, that’s how good and addicting it is. I also love that’s super creamy and rich, it’s not one of those watered down smoothies, quite the opposite! It’s creamy and velvety and filling. You can serve this Banana Blood Orange Smoothie as a quick breakfast when you are short on time or as a snack if you are looking for something to power your family during the afternoon. I also love to serve it as a quick no bake dessert for dinner when the days get too hot to think about turning on the oven. The Blood Orange gives the Banana Blood Orange Smoothie the pretty color and also provides the citrus tart punch that makes this recipe so good! If you are not very fond of Blood Orange you can swap it for some orange, the flavors are going to be different but they are super delicious as well. To make it just blend everything in your blender and that’s it. It’s a super simple stress-free recipe perfect for every day. – Pour all the ingredients into a blender and pulse until creamy. – Pour into 2 tall glasses. Tip: To make it extra creamy cut the banana into slices and place it in the freezer (I usually do this the night before) way better than using ice! Do you have some drink recipe you just can’t live without? Share it in the comments! Affiliate links are in this post for your convenience. This chocolate cherry ice box cake is by far my favorite summer dessert! This is a great go-to for company or a pot luck or BBQ where you don’t have a clue of what to bring. You can’t go wrong, everyone loves an icebox cake! I love how decadent and yet how refreshing this is since it is chilled until ready to serve. The graham crackers layered between get nice and soft, similar to a thin layer of cake. All of the flavors together are so delicious! There’s something about chocolate, cherries, and cool whip coming together that make this the perfect dessert! 1. Using an electric mixer, whisk milk and pudding powder for 2 minutes. 2. Gently stir Cool Whip into the pudding. 3. Refrigerate pudding mixture for 10 minutes. 4. On a rectangular serving dish, place 4 whole graham crackers length-wise into the shape of a rectangle. 5. Spoon the pudding mixture into a piping bag or gallon zip-loc bag and cut the corner. 6. Squeeze the pudding mixture from left to right and back, covering all 4 graham crackers. 7. Spoon 1/4 of the can of pie filling over the pudding mixture. 8. Repeat the layers until you’ve used all the ingredients. 9. Drizzle the chocolate over the top and refrigerate for 4 hours, until ready to serve. If you want a delicious, SUPER simple dessert to make, you’ve got to try this! I promise you, it will not disappoint. What about you, what’s your favorite go-to summer dessert? Cheesecake? Icebox cake? Homemade ice cream? If you like this, pin this recipe so you can find it later and follow our dessert Pinterest board for more yumminess. The holidays are upon us and I’m up on the grocery store. I head to Publix® to get some of baking needs. Specifically, I’m getting some Crisco® to help me out with my baking. I remember when I first started cooking that I didn’t really realize how important it is to use shortening when the recipe calls for it. We always had Crisco® shortening in the house, but for some reason we were out. I ended up using oil and my dumplings were a tremendous joke! Just a note – always use what the recipe calls for… but you know that already, you smart people, you. I decided to make brownies for daughter’s Sunday school class and needed vegetable oil, so off to Publix® I went. You can’t get an easier recipe than out of the box, but I found the perfect blondie brownie recipe from my sister-in-law’s cookbook, that she found from Crisco®! It’s really a no fuss, no frills recipe, but it has classic results that everyone raves over. I topped it with candy cane, edible confetti and voila, it is a Christmas recipe. I was able to make brownies with my daughter and create those memories together. I remember doing this with my grandmother, except she never shares her recipes. You just have to figure them out as she goes because she never has any of them written out! I’m writing down key recipes of these family favorites for my daughter – for posterity sake. If you want to be remembered, cook good food. Cooking good food means that you use good products. Crisco® is that. For the holidays and any time of the year, you can use Crisco® 100% vegetable oil for baking, but don’t forget the other everyday cooking products as well like Crisco® Pure Canola Oil and Crisco® 100% Original Oil. What about you? What favorite recipes do you go to or will be making for your guests? What homemade holiday treats are your families favorites? This post was sponsored by Michael Angelo’s but my opinions are my own. Finding a wholesome meal when things are busy is tough. You can find one easily though with Michael Angelo’s frozen meals. Some healthy foods are difficult to find because they’re only sold at health food stores or special brand stores. It’s different with Michael Angelo’s products. They are available at many different, normal stores, even Wal-Mart! I love that added convenience. You can see what stores near you carry the product with their website’s store locator. I came home and set the oven, but then after reading the instructions more carefully, I realized that you can microwave the meal! I’m in! Michael Angelo’s Lasagna with Meat Sauce was our choice. I popped it into the microwave, and it cooked for 16 minutes. The instructions said that there was no other preparation other than just putting it in the microwave. I really like that. It’s really lazy, but I don’t care for the over-detailed instructions that tell me to cut the plastic film over the food into star shapes to properly ventilate. Not a fan. The directions said to cook for 14 to 17 minutes. I baked for 16, and it was too much. My cheese was a bit crunchy, but my microwave does cook a little faster than others, so I should have anticipated that type of result. The quality overall was great. It was not excellent, but I think that was just my preference. I wasn’t crazy about the “tomatoyness” of sauce. I like a bit of cream element to my sauce or cheese mixed in, but this was just tomato sauce. The meat gave it a good balance, though, and the seasoning was a little pepper-heavy. What I loved about the dish is the ricotta cheese and the al dente pasta. The lasagna noodles were not overly fat and heavy; they didn’t consume the dish which is hard to avoid in a lasagna. The portions were good for the price ($8.99). It fed four adults (in addition to sides) comfortably. If we were having guests, I’d definitely want two packages, but for family it was just fine for a trial run. All in all, I’d love to do it again! I love that Michael Angelo’s is family-owned and family-operated by Michael Angelo and his mom Sara. (Small businesses! Yeah!) I love that they use real ingredients, with no preservatives, that I can pronounce. I love that it was convenient and ready to enjoy. To learn ore about Michael Angelo’s you can visit their website, follow them on Facebook, on Twitter, on Pinterest, or just look for them at your local store! 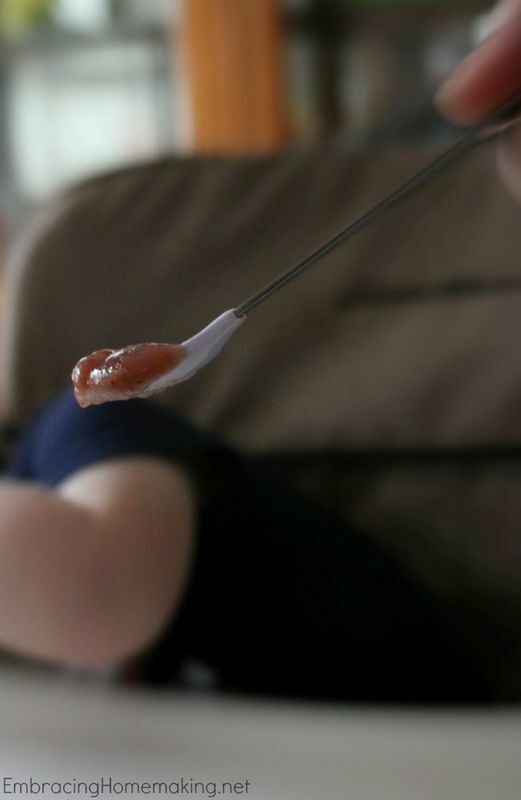 Are you an old-school mom who chews baby’s food for them? I know my friend’s mother did it for her, but I’m not too crazy on the idea. For some reason (hand sanitizer anyone? ), I am a germaphobe, even when it’s coming from me to my baby. Now that baby is getting ready to chew and being offered bites from a-hem sister’s plate, I’m in the position of figuring out what can be chewed and what shouldn’t be at this stage. Gerber 3rd Foods are really helpful in this area because they are specifically made to help with learning to chew. To be technical, it’s baby mushy food with “Lil’ Bits” thrown in to introduce chewing. Instead of sister throwing a chip at baby, I can have her help me feed him with these ready to go foods. Gerber 3rd Foods are specifically made to help with learning to chew. Lil’ Bits comes in convenient plastic tubs that come with their own lid which is perfect for busy mamas! With different tastes and flavors for baby to explore, I can get him ready for table food – from his OWN plate. 🙂 If your little one is in between mushy food and table food, look for Gerber 3rd Foods Lil’ Bits at your local store and visit here for more information. Growing up I remember my mom cooking and baking with my mom. We didn’t do it a lot but the times we did were very special to me. I can still remember the time my mom accidentally pulled the beater bar out of the chocolate cake batter before turning it off. I was sitting in my pjs on the counter beside the mixer when it happened. Chocolate went everywhere and I thought it was hilarious! She laughed at herself and took the accident in stride. We cleaned up, baked a cake, and had a great story to tell Dad. Now as a busy mom I want to remember to take time and cook with my kids. The messes and mistakes are worth the memories. Last Saturday, we baked blueberry muffins from scratch along with scrambled eggs. It was fun but it took so long to do that it ended up being brunch. 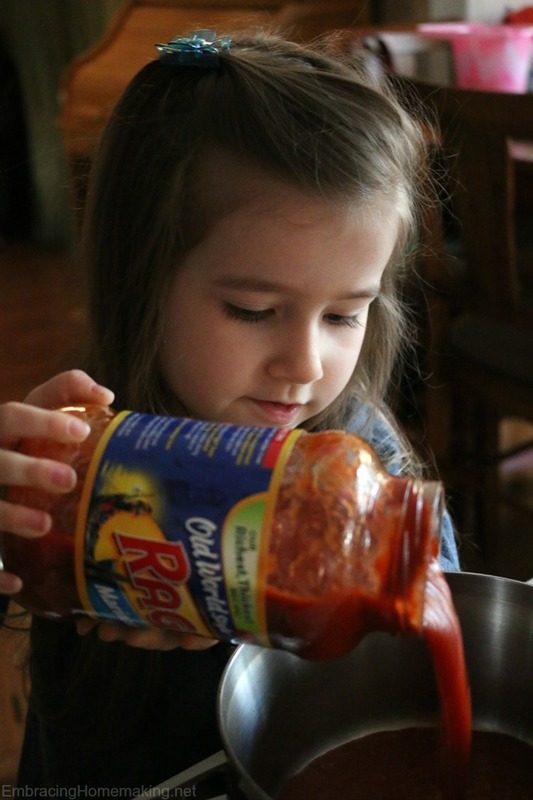 While I don’t have time every day to involve my kid’s in each meal preparation I try to every now and then. Tonight’s dinner was a simple one. 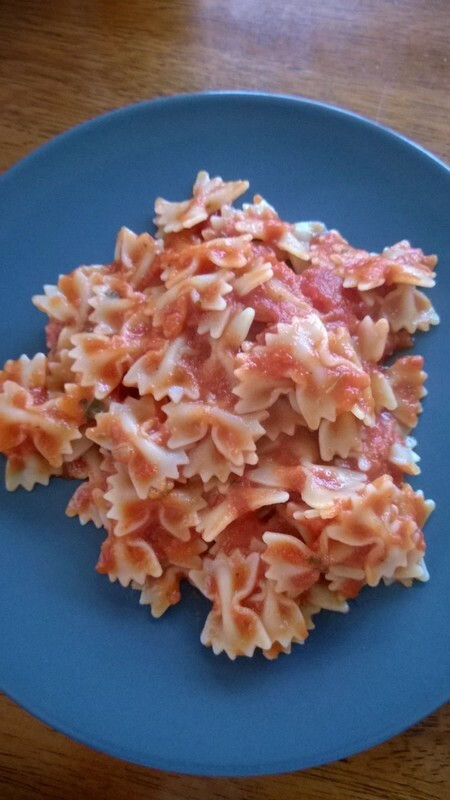 Ragu® sauce and bow tie pasta. Easy peasy and my daughter was able to help! She only poured the past in the the pot, poured the cooked pasta into the sauce, stirred it, and added Parmesan cheese to everyone’s dish but I know she felt like a chef. It may have been the chef’s hat and apron she was wearing that made her feel that way but I like to think it was because I spent time with her and allowed her the opportunity to serve her family. Occasionally we’ll enjoy “poor man’s pizza”. French bread (from the day old section, hence poor man), Ragu®, cheese, and pepperoni make these little pizzas we heat in our oven. (But don’t forget to toast the bread separately first. It holds the sauce better when toasted.) My grandmother used to make something similar for me after school with a little sandwich press. I can vividly remember watching her make them and finally being old enough to help her make them. Maybe our poor man’s pizzas will bring the same fond memories to my daughter’s mind one day. For spur of the moment poor man’s pizza, I keep the ingredients on hand. Getting them at Kroger with everything else I need is just like a basic staple. 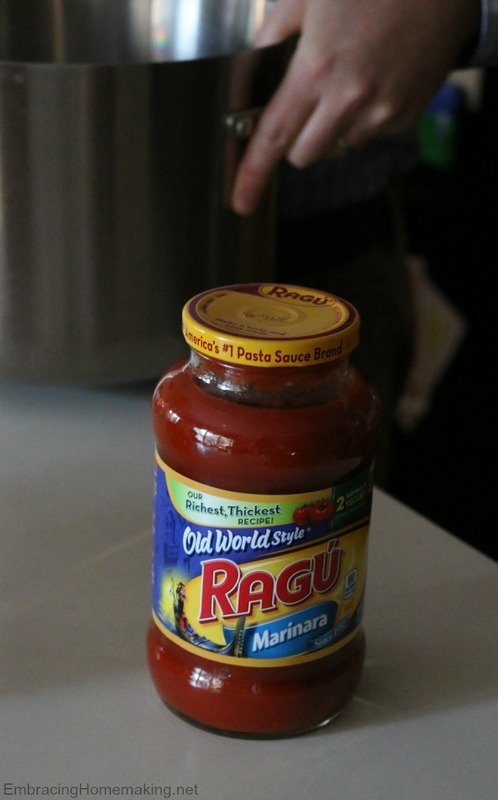 I always have Ragu® on hand. I love that it’s ready, and I can have a quick, quality meal made for my family without spending all my time in the kitchen. As much as we love cooking together, having the flexibility to choose where we spend our time together is just as awesome! This is a sponsored conversation written by me on behalf of Ragu® . The opinions and text are all mine. I encourage my son to play with his food. Yes, you read that right. As much as it goes against every fiber of my body I force myself to help my son play with his food. 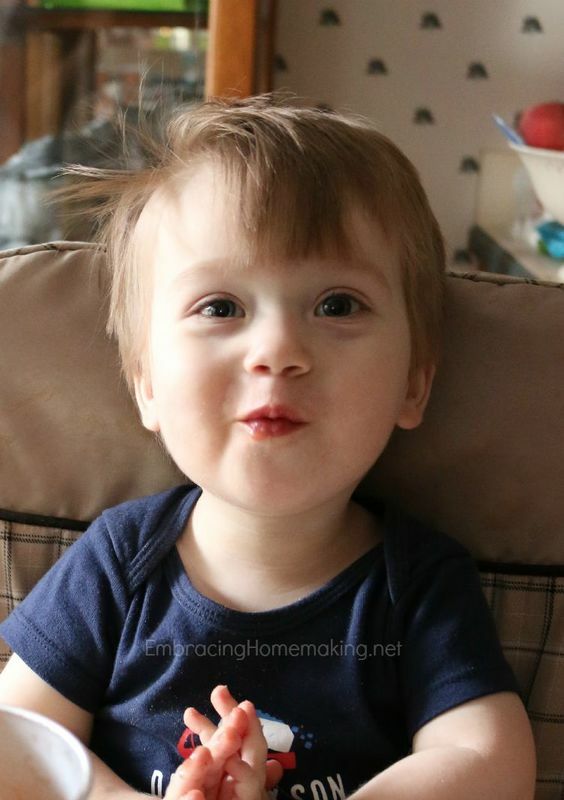 He has sensory issues…food issues…and food allergies. All of that combined equals a toddler who still takes a bottle more than he eats food. He sees a therapist weekly and starting next month he’ll see two separate therapists weekly to help him eat food. Sigh. All the planning and preparation is tiring. Mentally exhausting. I want him to succeed like all moms want their kids to succeed so I press on. I’ll let him practice with different sized cups, spoons, cold foods, warm foods, crunchy foods, and squishy foods. My son will eat one brand of puffs, one variety of veggie straws, bits of (soy-free and milk-free) bread, crackers, coconut milk yogurt, pizza crust, and pouches of baby food. That’s allllllll he will eat. He won’t drink water or juice. Besides his bottle, the pouches of food are his only source of liquids. They’re also the only veggies and fruit he’ll consume so I buy them in bulk. The Sprout brand is my brand of choice because I trust that they use are real, honest ingredients. My sweet son won’t eat much but that means that what he does eat is even more important. I love that he’ll drink the pouches on his own. It makes eating on the go so nice. Plus, the Sprout brand flavors are so good that if my son doesn’t like one, my preschool daughter will. No waste, I love it! My kids are growing up so fast and I want to give them the best nutrition I can. If you have little kiddos, what’s their favorite flavors? My son loves Sprout’s Pear, Kiwi, Peas, and Spinach.